Today: Choose your own adventure with a tangy salad and slightly sweet, Asian-inspired snickerdoodles. We get it: Weeks can be unpredictable. Some Mondays, we charge out of the gates with a full-blown meal plan and a refrigerator full of made-ahead meals. Other days, we're hit by the 5 o'clock realization that we have no plan for dinner. This meal is for those days—either of them. This dynamic Asian duo of Citrus Ginger Tofu Salad with Buckwheat Soba Noodles and slightly sweet Matcha Snickerdoodles can either be made largely the night before or pulled together the day-of. So take a look at your schedule, grab a bag of matcha and some tofu, and choose your own adventure. We've offered you both day-of and make-ahead options so you can mix and match(a) depending on your schedule. Click through on the recipe photos or titles to see (and save and print) the full recipes, or take advantage of our handy grocery list and overview below. We are assuming you already have brown and granulated sugar, flour, butter, maple syrup, kosher salt, garlic, olive oil, eggs, tamari, baking soda, cayenne pepper, and honey. If not, add those to your list, too! The night before, make the dough for the Matcha Snickerdoodles. Scoop the dough by the scant tablespoon onto a parchment paper-lined cookie sheet. You should be able to fit about 8 cookies onto the sheet with room to bake. The dough makes enough for 50 cookies total, so set the rest of the dough into an airtight container in the freezer for another week—we already know you like to make things ahead. Wrap the entire sheet of cookies in plastic wrap and let it chill in the refrigerator overnight. Prepare the tofu marinade, then place it into a jar and set it in the refrigerator to use tomorrow. The next evening, 1 hour before dinnertime, preheat the oven to 350º F and remove the baking sheet from the fridge. Let it sit at room temperature while you prepare your tofu salad. Pour the marinade you made last night over the tofu, and bake it for 30 minutes, basting it halfway. While the tofu bakes, boil the soba noodles and blanch the broccoli, then toss them with the remaining vegetables, herbs, and sesame seeds. Thirty minutes before dinner, take the tofu out of the oven and replace it with the baking sheet of matcha cookies (no need to adjust the oven temperature—they both bake at 350º F, but do remember to remove the plastic wrap). Remove the tofu from the pan and whisk the remaining marinade from the baked tofu together with lime juice and zest to prepare a vinaigrette. 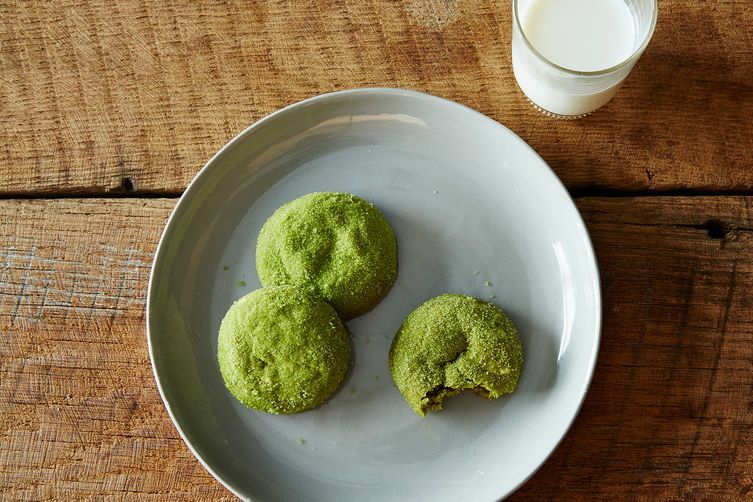 After 8 to 10 minutes, take the cookies out of the oven and immediately toss them in a matcha-sugar mixture. Place them on wire racks to cool. 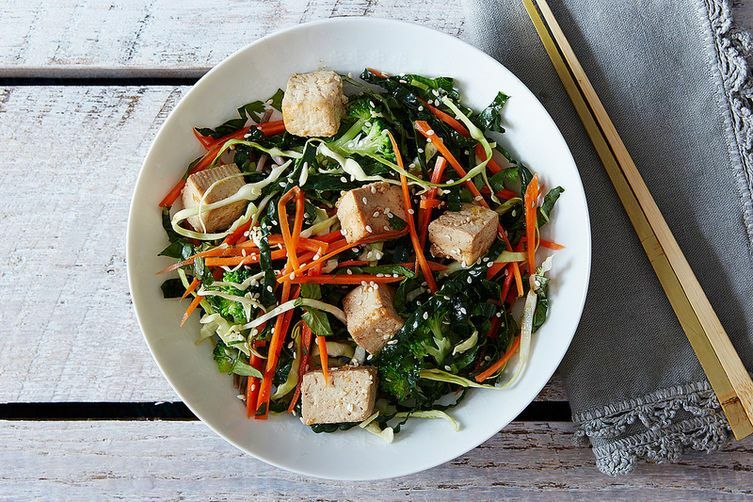 At dinnertime, toss the salad base with the vinaigrette and top with tofu to serve. After dinner, skip doing the dishes and head straight to the cookies while they're still warm. We know you like to plan ahead, but dishes can wait. Four and a half hours before dinnertime, start making the dough for the Matcha Snickerdoodles. Wrap the dough in plastic wrap and let it chill in the refrigerator for 2 hours. Two hours before your meal, remove the dough from the refrigerator and let it sit at room temperature for 1 hour. With 1 hour until dinnertime, preheat the oven to 350° F. Scoop the dough onto parchment paper-lined cookie sheets and bake for 8 to 10 minutes. When the cookies are barely golden around the edges, remove them from the oven and immediately toss them into a mixture of matcha and sugar. Place them on wire racks to cool. When no one's looking, grab a bite of the warm cookies—you still have 45 minutes until dinnertime, so technically it still counts as an afternoon snack, rather than a pre-dinner cookie, right? Prepare a tamari-based marinade, then pour it over the tofu, and bake for 15 minutes (no need to adjust the oven temperature—they both bake at 350º F). Baste, then bake another 15 minutes. While the tofu bakes, boil the soba noodles and blanch the broccoli, then toss with the remaining vegetables, herbs, and sesame seeds. Fifteen minutes to dinnertime, take the tofu out of the oven. Remove the tofu from the pan and whisk the remaining marinade from the tofu together with lime juice and zest to prepare a vinaigrette. At dinnertime, toss the salad base with the vinaigrette, and serve. Pretend you didn't eat a cookie earlier, and have 2 for dessert (because who's counting?). Leslie, the Tofu Salad looks so tasty, have added it to my list for this week. Having the options of "day of" and "make ahead" is very helpful!